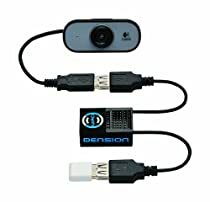 The Dension WiFi RC is a plug & play wireless RC receiver. It allows you to control your RC car, boat, tank, construction machine or any other RC vehicle with your iPhone using WiFi. The iPhone application, available for free in the App Store, lets you drive with on-screen joysticks or by tilting the phone, while watching the real-time video stream coming from your vehicle. The reciever unit could be mounted at the same place as the RC reciever used to be. The sender will be you iPhone, iPod touch or iPad. If you mount the delivered camera, the picture from the driving car will be provided on your control device.